In 2008, Continental shed 12,499 employees. HANOVER, Germany -- Continental today said it will increase cost-cutting this year after posting a net loss of 1.1 billion euros in 2008, compared with a profit of 1.02 billion in 2007. 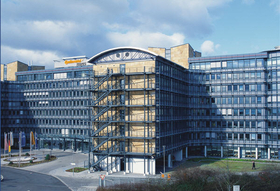 Continental CEO Karl-Thomas Neumann said the supplier's top priority in 2009 will be to continue reducing its net debt. Neumann said the supplier reduced its net debt by about 373 million euros in 2008 to 10.48 billion euros. "The start into the first quarter of 2009 shows just how great the current year's challenges will be. The slump in sales, particularly in the automotive divisions, is likely to accelerate in the first half of 2009," Continental CEO Karl-Thomas Neumann said during the company's annual press conference in Hanover on Thursday. Continental's full-year loss came in the wake of a fourth-quarter net loss of 1.49 billion euros compared with a 195-million-euro profit in the same period in 2007. Continental said its automotive group did well despite being hit hard by the extremely adverse market environment. "With sales amounting to 14.90 billion euros, the automotive group achieved an adjusted EBIT of 908.9 million euros and a 6.1 percent margin," Neumann said. Chief Financial Officer Alan Hippe said the operating result of Continental's rubber and tire group was "outstanding" in view of the current economic situation. With sales at 9.35 billion euros, the rubber and tire group generated an EBIT of 984.9 million euros represents a 10.5 percent margin. "This result is all the more remarkable since the group was burdened with additional raw material costs amounting to roughly 290 million euros," Hippe said. Continental said its 2008 sales increased to 24.24 billion euros from 16.62 billion in 2007, representing a margin of 7.6 percent. The increase resulted from Continental's acquisition of Siemens VDO. In 2008, Continental reduced its work force to 139,155 after shedding 12,499 employees. In addition, contracts with some 5,000 temporary workers were not extended. Continental said it is in constructive talks with its controlling shareholder Schaeffler Group about ways for the two companies to cooperate. Beyond having to combat a severe industry downturn while paying off 10 billion euros in net debt, Continental has to compensate for the departure of top management following a leveraged bid by Schaeffler. Privately held Schaeffler, which is owned by billionaire Maria-Elisabeth Schaeffler and her son Georg, is seeking a government bailout and over the longer term says it plans to raise fresh capital from an investor when it can find one.